Professional Video Sales & Rentals for :: Broadcast :: Live Event Production :: Streaming :: Encoding :: Shared Storage :: Post-Production :: Sports :: and Web Delivery ... book a demo today! What is a Video Switcher? A video switcher is a device or software that lets you to select between various video and audio signals. With sources like (cameras, video playback devices, computer sources, microphones etc.) you can seamlessly direct any of the selected source to a single output. This output can then be streamed, recorded or displayed on a device like a projector or screen. By wiring everything into the video switcher the operator can easily organize the sources and put them on air without much effort. This image shows the possibilities of what can be wired into a video switcher. To simplify this even more, some video switchers have built in playback devices like DDR(digital disk recorder) and graphics. The nice thing with a more powerful video switcher is the ability to resize and move the sources on the screen and therefore you can overlay multiple source on air at the same time. Some even offer the ability to pull a key(green screen) for use with virtual sets. One of the most powerful video switchers from a company called NewTek is the Tricaster, is an entire TV station in one box. It can do pretty much everything you need inside of one computer. It even includes the ability to stream to the web. You can add transitions between your videos, to your graphics as you take them on and off air. All in one systems help reduce the amount of man power required. How do I know if I need a switcher? There are many scenarios that would benefit greatly from the use of a video switcher. Live Event – This type of production is found at concerts, house of worship or corporate events. Usually you are producing video for in house consumption like a projector or large format screen or maybe even streaming to the web. Usually there will be multiple cameras, computer sources and possibly video playback where you need to transition seamlessly between the input sources. Webcasting and podcasting – Both webcasting and podcasting have similar results. Usually you are aiming at an external audience through the Web. At the same time you may even have an in house audience you would like to reach. Transitioning between sources can keep the presentation interesting by showing close up shots, 2 or 3 person interviews, and even playback videos produced prior to the show. The more production value you include the less likely you are to appear amateur. Sporting event – Most often sporting evens have more than one camera. In fact you will often find 3 – 5 cameras around sporting venues. I would normally have at least one camera on each goal, a wide shot camera and a close follow shot camera. During the game you will want to show player stats, team stats and possibly even highlights from previous games. This requires the ability to show graphics over top of the video and update the stats before you put them on air. This is usually done either by the switcher operator or a graphics operator nearby. In this scenario you would most likely need a larger switcher with 5 or more inputs on it. Video Production is the process of producing video content. As video has become an everyday consumable. It shows up on so many platforms that producers are working harder to create videos that capture the viewers attention. There are many factors that go into making a good video including story, sound, lights, props, graphics, talent and camera angles. There are many companies that make video switchers and products to help with production. 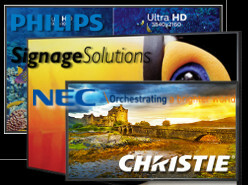 Vidcom represents several brands of video switchers that will help you produce a more interesting show. Along with video switchers, we carry many different support products as well. With so many options, we recommend having a discussion with one or our specialist to help you understand these options and find the best products. We would be very happy to discuss your project requirements to help you decide the best course of action for your production to take. VidCom has been providing hardware and software to Western Canada and North Western United States for over 35 years. With engineers on staff and knowledgeable salespeople, we are able to help identify exactly what you need to make your visions a reality. Give us call and talk to a specialist who can help you identify the best product for your needs! Speaking with a specialist can often help you find better, more efficient ways to accomplish your goals. Don’t forget to join our weekly newsletter! Looking for a product or solution? At VidCom, we make your production life easier by being experts in your field. Since 1980 we have been offering creative, and more importantly, time and cost-saving solutions as a systems integrator for: Broadcast, Live Production, Streaming, Encoding, Storage, Post-Production, Sports & Mobile TV, and Web Delivery serving the best customers in Western Canada. We are proud to help our customers find Amazing Products, and give them Amazing Customer Support. Copyright © Vidcom Communications Ltd.